Did you know that it has been almost a year now since I sent in my final Doughnuts manuscript? Plenty of time to make more doughnuts and learn a few more things. One thing I learned during my dive into doughnuts is if you ask who makes the best doughnut in town to 10 different people, you’ll probably get 10 different answers. For example, some folks don’t like a strong yeast flavor in their raised doughnut. Just one look at my yeast raised dough, the first one in the book, you’ll see that I’m not one of those people. I like the dough to have some flavor to it; I enjoy a little yeasty kick at the end (not to mention the insane lightness and softness it gives to the dough). And apparently, so do my recipe testers and neighbors. But, after a local taste test against the top doughnut shops in Seattle last June, I was inspired to give my raised dough recipe a little tweaking to see if I could get doughnut shop results with a less yeasty finish. As it turns out, the variation is insanely simple: use less yeast and wait longer. In fact, I’ve tried it with 1/2 the yeast called for in the original recipe (and twice the proofing time), and gotten nice, light, well-proofed doughnuts without the yeasty finish. to proofed in 37 minutes! So, if you are one of those folks who prefer a less yeasty dough, give this one a shot. You can apply this same change to the chocolate raised and vegan raised doughs too. Of course, it was far, far too late to add this variation to the printed book. Thank goodness for the blog! In a medium bowl, dissolve 1 tablespoon of the yeast into 3/4 cup of the milk. Add 3/4 cup of the flour and stir to create a smooth paste. Cover and let rest in a warm spot for 30 minutes. Combine the remaining milk and yeast in the bowl of a stand mixer fitted with the paddle attachment. Add the rested flour mixture along with the vanilla and egg yolks. Mix until smooth. Turn off the mixer and add 1 cup of the remaining flour and top with the sugar and salt. Mix on low for about 30 seconds or until the dough starts to come together. Add the butter and mix until it becomes incorporated, about 30 seconds. Switch to a dough hook and add more flour, about 1/4 cup at a time with the mixer turned off, kneading the dough at medium speed between additions, until the dough pulls completely away from the sides of the bowl and is smooth and not too sticky. It will be very soft and moist, but not so sticky that you can’t roll it out. You may have flour left over. Cover the bowl with plastic wrap and let it sit in a warm place for 30 minutes. Gently degass the dough, and refrigerate for at least 1 hour (and up to 12 hours). Line a baking sheet with a lightly floured non-terry dish towel. Roll out the dough on a lightly floured surface to 1/2 inch thick. 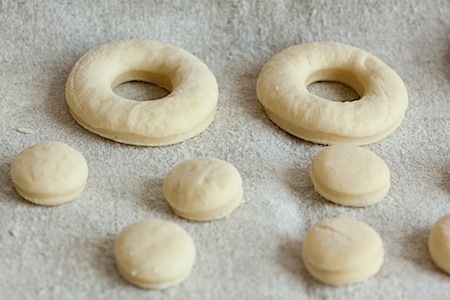 With a doughnut or cookie cutter, cut out 3-inch-diameter rounds with 1-inch-diameter holes (for filled doughnuts, don’t cut out the holes). Place the doughnuts on the baking sheet at least 1 inch apart and cover with plastic wrap. Let sit in a warm spot to proof until they almost double in size, about 30 to 40 minutes, testing at five-minute intervals. To test whether the dough is ready, touch lightly with a fingertip. If it springs back immediately, it needs more time. If it springs back slowly, it is ready. If it doesn’t spring back at all, it has overproofed; you can punch it down and reroll it once. While the doughnuts are proofing, heat a heavy-bottomed pot with at least 2 inches of oil until a deep-fat thermometer registers 360˚F. With a metal spatula, carefully place the doughnuts in the oil. Fry for 1 to 2 minutes per side, or until light golden brown. Remove with a slotted spoon, drain on a wire rack over a paper towel, and let cool slightly before glazing. This entry was posted in Cook and Eat, Cookbooks, Doughnuts, Recipe, Sweet. Bookmark the permalink. Thank you for this. I guess I know which donut recipe I’ll be making this weekend. My goal is for tall, airy and tasty donuts, with a light “proof line” to match yours. I’m going to ask one last annoying question: What is the significance of refrigerating the dough? Is it a step we can skip, or does the slow time at a cool temp improve the flavor/rise? Happy to answer questions! Please don’t hesitate to ask. For the refrigerating, primarily, it’s to make the dough easier to work with by firming it up some and making it a bit less sticky. The dough will probably need a bit more flour when you are rolling it out if it is not chilled. More flour tends to lead to greater oil absorption. I also think there is some flavor advantage to a slower rise, and it definitely helps you adjust the overall timing (you can make the dough the night before, and just cut/proof/fry in the morning). But, I do think you can skip it if you want and just let them sit at room temp a bit longer. They look delicious! So fresh! I love making recipes like this. I just wish that I had the time to raise bread (and donuts) more often. Ask and ye shall receive! Thanks for the inspiration. Now I have to go on a doughnut run (ie, the run you have to do to work off all the doughnuts you ate). Thank you so much for this recipe. I’ve never been shy about trying different recipes but never did doughnuts. Until now. So easy. I used to get doughnuts when I was at university. After midnight a local doughnut bakery would sell doughnuts freshly made after they finished the next days order for the local stores. Nothing matched the taste until now. Thank you so much for the useful tips . But if I made egg less donuts using the above recipe can I still lower the amount of yeast because there will be no additional leavening action of eggs. Also, can I use soy lecithin & oil in place of egg yolks . Yes, you should be able to reduce the yeast, and follow the mixing instructions (which vary just slightly in the way the salt is added, to help preserve the yeast) in this recipe with the vegan ingredients in the book. I haven’t tried using soy lecithin & oil in place of the egg yolks. In my vegan version, I use soy milk as the main dairy replacer and some potato starch to help bind. They rise just as much (maybe even more) than their egg including counterparts, but the flavor is a bit lighter. Thanks again for the quick reply . I can’t wait to try the recipe .YUM !! Lara, what a great recipe! The only other time I’ve made donuts was from a Martha Stewart recipe, and the taste wasn’t worth the effort. I can’t wait for my copy of donuts to come in the mail! Hi Lara, I am drooling as I am sitting here 🙂 it looks wonderful! I have a quick question, can you double the recipe ingredients? Is it still do-able or does the proof time increase? Hi Aneesa – Yes, the recipe can be doubled. The proof time should still be fine. I suppose that there is a small chance that after the final proof, while you are frying, the last few doughnuts might have overproofed by the time you are ready to fry them, but I wouldn’t worry about it too much. If it is a problem, then I’d recommend splitting the dough in half, rolling out the first 1/2 and getting it proofing for a few minutes before rolling out the second half. Then, the 2nd half would be ready to fry just about the time the first batch was done. just came across this site . just finished trying several donuts for hanukah. so so. tried some zepolle but they are heavy and greasy and only taste edible within half hour of frying. do you have a good zeppole recipe that is lighter, fluffier and will taste good at least for afew hours. i see them sold at street fairs although i never tasted those. they look yummy. thanks. I live in Central America in what would be considered an fairly rural area. The local wheat flour is not of a high quality, as corn flour is most used here, There are a few North Americans here, not many, and we were wishing for a good raised doughnut. I tried every recipe I could find. I can stop trying now. These came out beautiful. I will be making them as a Christmas treat for all my friends. Gail – Thank you for your comment! I love hearing from folks who try the recipes… and so glad when it they turn out beautifully. Hope you had a lovely Christmas full of doughnuts! My little girls loved the doughnut holes. It was like eating clouds–soft and chewy–not crumbly. I’m in love. Monique – Thanks so much for leaving a comment, and I’m thrilled the doughnuts came out well for you! I unfortunately couldn’t view the link, but I’m picturing your little girls eating doughnut clouds anyway! Thanks a lot for this recipe, it’s really great. I tried it out that afternoon, the first time I made doughnuts. There was a problem when I fried them… the surface of the doughnuts became very bumpy, it wasn’t flat at all. What did I do wrong? Was the oil too hot or was it something with the dough? They also got way too dark, but that’s probably cause the oil was too hot. Yes, if the doughnuts got to dark, the oil might have been too hot or you fried them too long. For the bumpy surface, I’m not sure that I understand exactly what this was like, but I’m guessing that it might have been the oil temperature as well. Do you have a thermometer that can test the temperature of the oil? This is a pretty important part. If not, then do make sure that the oil isn’t smoking when you fry your doughnuts. It also is possible that it might have been the oil you were using. I prefer safflower oil for frying doughnuts, but canola or peanut oil are fine too. However you don’t want to use any low smoke point oils. I used sunflower oil, but it did not smoke at any time. I’m going to try with safflower oil next time. Well it was the first time I made doughnuts and at least they tasted good. I’ll definitely try it again. Thanks for your comment. It’s really a great question… fresh homemade doughnuts only really stay fresh for a short period of time. The gums, which I added the highlight for, as well as the Soy Flour, are what I believe what help the doughnut stay softer, longer. However, I’m not an industrial baker, so that’s just a guess. 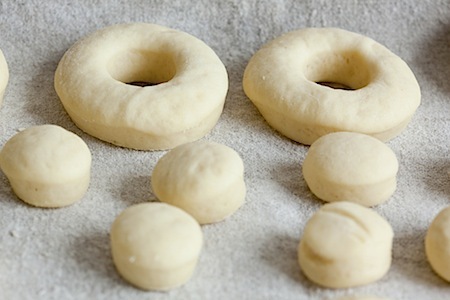 For homemade doughnuts, keeping them fresh has more to do with storage than a change in the recipe. Glazed doughnuts, in my experience, stay softer longer, as well as keeping them in an air tight container. Unfortunately, the glaze is likely to get wet with this storage method, and not maintain that nice freshly glaze texture. 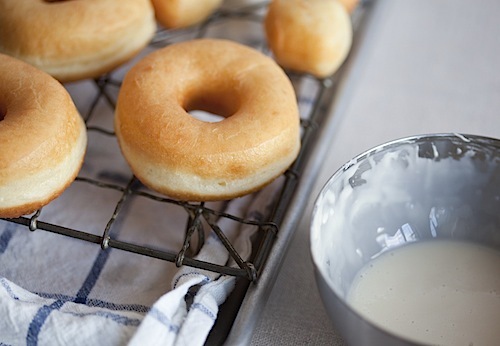 My husband swears by 15 seconds in the microwave to freshen up any doughnut (but you’ll still need to eat it quickly). I think you’ve inspired me to play some mad scientist though, to see if I can come up with the best way to store doughnuts for a day or two. It might take a little while for me to compare all the permutations… but I’ll blog about it once I do. Also, I think I’ll try a batch with a bit of soy flour added to the bread flour to see if that helps the pastry maintain the moisture. It also may help reduce oil absorption, also a plus! One thing I’ve noticed with the past two batches I’ve made is that, a day later, they seem to deflate somewhat, and get a little more dense and wrinkly (though still delicious). Is this simply an effect of the donuts going stale, or do you think it could be indicative of them not rising enough / rising too much (or some other ailment)? I am doughnut lover 🙂 but i try to avoid flying process. I wonder if i can follow doughnut recipe with “flying” method but “bake” them instead? Thank you ^_^ for your time. What does “flying method” mean? Can I replace whole milk with skim milk? i love your book but i have 2 questions can i substitute soy milk for the hole milk and if i cant find bread flour what can i use instead? Soy milk should work just fine. For bread flour, you can use all purpose, but the texture won’t be quite the same. and can i leave the dough in the fridge over night and make it the next day? The raised dough should be fine in the fridge for up to 12 hours or so. It may take longer to proof the next day, so make sure to leave time for that. i made the dough last night is it ok if its in the fridge longer than 12 hrs will it not taste the same? It will be ok for a while, but don’t leave it too much longer or the flavors will start to change and it will be harder to proof. one other question can i use water instead of milk? I haven’t tried with just water, but it should work. They may taste a bit different, and perhaps not brown as nicely when frying. I have read where 1 teaspoon quick rise yeast should raise 1 cup bread flour – – then I read 1 cup bread flour only requires 3/4 teaspoon of quick rise yeast. I just felt your doughnut recipe was calling for a lot of yeast ( 4 teaspoons active dry ) to raise 2 – 2.5 cups of bread flour……..Comment please. SECOND QUESTION, could I substitute “sour milk” (buttermilk) for the 1 cup whole milk ( 3.25% ). I have read where the sour milk gives the doughnut a very slight acidic taste finish. Looking forward to trying your doughnut recipe. Your website says its the first one in the book. Many Thanks. Comment please. I’ve found a bit more yeast yields a lighter, more tender doughnut that is less prone to problems proofing, but you could always try with a bit less. The yeast in the recipe is not instant yeast, so if that is what you are using, you will want to use a bit less. As for the buttermilk, that should be a fine substitution! Let me know how it goes for you. Lara, I will try your dognut recipe soon, however, I’m interested in a recipe for a Korean Seafood pancake. If you’ve made Kim-Chi, thought maybe you could lead me in the right direction. Please email your responce to me at akupper@comcast.net thanks for any help you can give me. Im doing a project for school and was wondering if you could tell me what the historical significance of yeast raised doughnuts is?